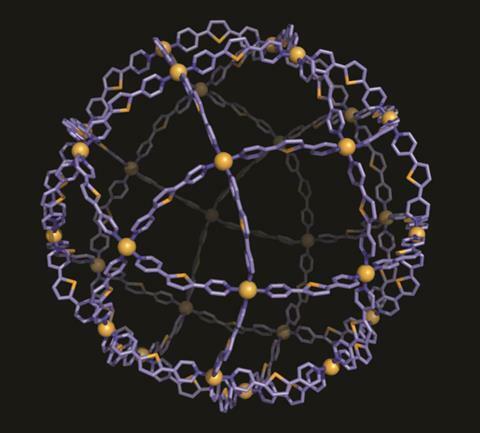 Japanese researchers have assembled a 144-component ball-shaped ‘tetravalent Goldberg polyhedron’, the largest known synthetic cage made from metal ions and organic molecules. Having produced a smaller version of the hitherto unseen molecular assembly by chance, the University of Tokyo scientists predicted and produced a larger version. That achievement suggests ‘mathematics could be a useful tool to establish a self-assembly design principle’, according to team-member Daishi Fujita, something that chemists have been keen to show. The Tokyo team, led by Makoto Fujita, has previously self-assembled several polyhedra by mixing palladium atoms and organic ligands. Because each palladium atom can link to four ligands, and each ligand to two palladiums, they’ve been able to produce near-spherical icosidodecahedra containing 30 palladium atoms and 60 ligands. Looking to double the size of these polyhedra to what they think is the largest they can be, the researchers adopted slightly more bent selenophene ligands. 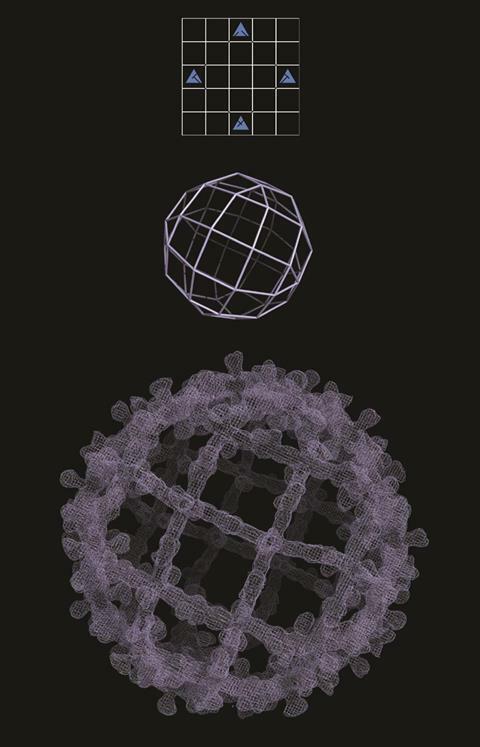 But instead of the polyhedron they were expecting, they got another 90-component shape, with low-resolution x-ray crystallography indicating its difference to their previous icosidodecahedra. Decoding the structure, they saw a Goldberg polyhedron composed of eight triangles and 24 squares. Using graph theory the team calculated that they should be able to produce tetravalent Goldberg polyhedra with 48 palladium atoms and 96 ligands. The chemists also hypothesised that the selenophene ligand shape should make this 144-component arrangement more stable than the 90-component version, and therefore tracked down the conditions to produce it. Daishi Fujita says that the mix of simple geometry and graph theory employed in the Goldberg polyhedra drove his team to use it to predict self-assembly better than their previous approaches. ‘We could establish a very simple theory to explain and overwrite our previous works,’ he says.